PHU THO (VNS) — For years, stone exploitation has disrupted daily life for the 20 households living near Trung Anh Company's quarry in northern Phu Tho Province's Yen Lap District. "When dynamite is used to loosen rocks, our houses are showered with stones," said Du Quoc Tai, who lives in the district's Dinh Village. Tai's fellow villager Ha Thi Minh was terrified when an 8kg stone from the quarry landed in front of her house. 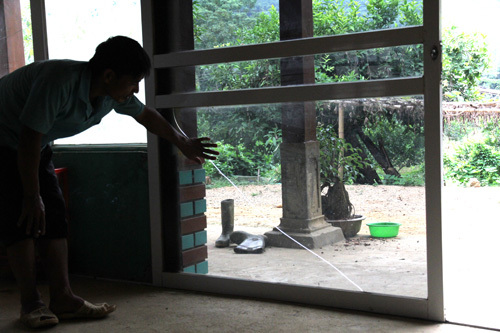 Hoang Ngoc Cham, who lives 700 metres from the quarry, said his house's glazed door was broken by a similar stone. Local residents also complained about noise and dust. Authorised agencies had failed to monitor companies' implementation of stone exploitation regulations, explained Hoang Nhu Lo, head of the Mineral Management Office under the provincial Natural Resources and Environment Department. Chairman of Yen Lap District People's Committee Nguyen Truong Son also blamed the situation on poor management by authorised agencies. The province has 24 quarries, mainly located in Yen Lap and Thanh Son districts. Yen Lap district had conducted inspections of 14 local quarries, according to Son.